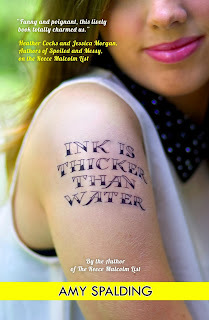 I was pleasantly surprised by how much I enjoyed Ink is Thicker Than Water. This book is an engaging, thoughtful contemporary that I'd recommend for Sarah Dessen fans. I'm definitely going to have to check out this author's previous book, The Reece Malcolm List. What I love about this book is how it's simply about everyday life. Although it's fun to read imaginative fantasy books or dystopians, sometimes it's nice to just relax with a coming-of-age contemporary book. I found that I could really relate to Kellie and her desire to figure out who she is. I was also surprised by the humor laced throughout the story. Kellie has a hilariously dry wit that made me highlight multiple lines in my Kindle. Oh, and the relationships in this book are written so realistically - especially Kellie's relationship with her sister, best friend, and boyfriend. She and her sister argue sometimes, but they're also there for each other despite all the changes happening in their family. And I love how Kellie and her best friend, Kaitlyn (who has the same name as me - even spelled the same way, which hardly ever happens, haha) slowly drift away, but eventually realize that they don't have to be enemies and can still be friends, even if they're not as close as they once were. Lastly, Kellie and her boyfriend Oliver have such a realistically awkward relationship. They don't always get along perfectly and their personalities clash at times. I love the way their relationship is resolved at the end of the book. As I mentioned, Kellie is a great main character. With her witty voice, it's easy to like her. I thought she was a pretty mature character, but I also like how she has a few flaws. And she can be a little dorky at times and unsure of what she wants in life. It's the perfect coming-of-age story. The minor characters are amazing too; I love her quirky family. There's not much to the plot; but it never bothered me that it was just about everyday life. There always several storylines happening concerning Kellie and her family and friends, as well as some great life lessons, and it held my attention very well. Ink is Thicker Than Water is a wonderfully thought-provoking contemporary. It really reminded me of a Sarah Dessen book, so if you enjoy Dessen's work, you should definitely check this out. This book is perfect for those looking for a realistic coming-of-age story. Favorite quote (takes place on Halloween): "Why are you Batgirl?" Adelaide asks. "What's the significance?" "My little brother had most of this stuff already," I say. "The significance is laziness."